THERE ARE THREE WAYS TO REVIEW A MOVIE: BE FIRST, BE SMARTER, OR USE SPOILERS. 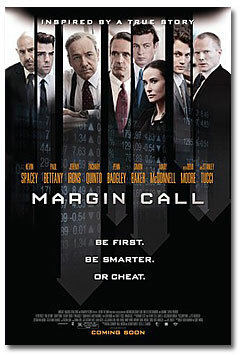 “Margin Call” is a smart, relevant film that is also curiously isolated. The terms we’re used to hearing about the global financial meltdown—“toxic asserts,” “mortgage derivatives,” “subprime mortgage loans”—are rarely enunciated. The reasons Eric Dale and 80 percent of his floor are let go at the beginning of this 36-hour period are never mentioned. Things just happen. If you didn’t know any better, you’d think the global financial meltdown began here, with this 107-year-old investment bank, rather than with policy decisions dating back to at least 1999 and probably earlier. Ditch digging, ironically, is where we last see him: digging a hole in the front yard of the home he used to share with his ex-wife, to bury their old dog, who died of a tumor as Sam was rallying the troops. It’s one of the few moments in the movie where we’re not in a corporate high-rise so it feels a bit out of place. It’s dirt and grass rather steel and glass. And yet it feels exactly right. In some ways the scene feels like the last few years. Something beloved is being buried in a place where we no longer live.